Exploring Lake Pickering was published (in 2002) to mark the centenary of Professor Percy Kendall’s theory that a great lake, Lake Pickering, had existed in the Vale of Pickering at the end of the Ice Age. 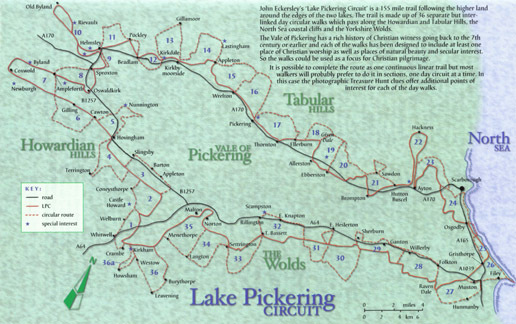 The Lake Pickering Circuit is a 155-mile trail following the higher land around the edge of the Vale of Pickering. The trail comprises 36 separate but interlinked day walks and encompasses the Howardian and Tabular Hills, the North Sea Coastal cliffs and the Yorkshire Wolds. Click here to view some more example images from this book. There are no copies of this book remaining. A Stone, another stone, more stones and the Kessock Bridge! Books by John and Nancy Eckersley Blog at WordPress.com.